Venezuelan President Nicolas Maduro announced on Tuesday the government is naturalizing all of its immigrants as citizens. Venezuelan President Nicolas Maduro decreed on Tuesday to naturalize all immigrants in Venezuela during a speech in which he rejected Trump’s comments against his government and in support of a military coup against the socialist leader. 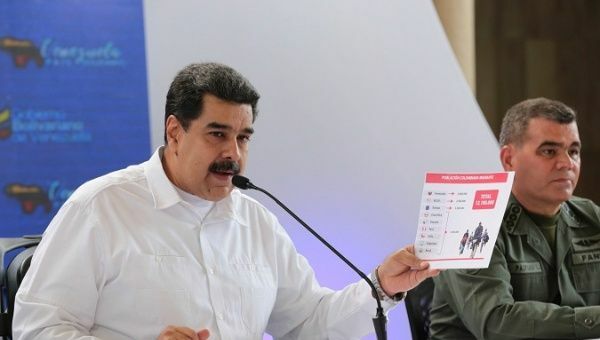 “I will proceed to sign a decree where I make legal 8,381 immigrants from various parts of the world and support the migration of the world,” Maduro said at a meeting with international representatives visiting Venezuela. He emphasized that by signing the decree he is naturalizing 5,781 citizens from the Colombian movement. In addition, 207 immigrants from Ecuador, 253 from Haiti, 56 from Italy and 357 from Syria are being welcomed by the Venezuelan government. There are 92 Portuguese, 392 from Peru, 63 from Spain, and 118 from Chile, among other countries. The Venezuelan leader dared U.S. President Donald Trump to do the same and legalize Latin American immigrants as per his own example. “I make public the request that President Trump sign a decree establishing the legality of all Latinos and Caribbeans who live in the United States,” said Maduro. In addition, the Venezuelan head of state will request US$500 million from the United Nations to support Plan Vuelta a la Patria and to support Colombian and Ecuadorean immigrants and other nationalities living within the country.